Acolytes serve God through their service in the church. They assist the clergy in a liturgical service by performing minor duties. Our acolytes are leaders in the church through the examples they set at the altar. 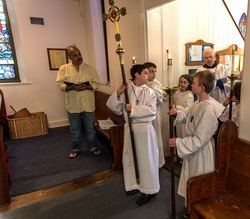 Our team of acolytes consists of 16 dedicated children and teens and the occasional adult! Clearly they are significant members of our congregation.